Watercress (Nasturtium officinale) is a wonderfully tasty crop, hot and peppery, and very easy to grow at home. Watercress also has many health benefits accredited to it, but I grow it for its superb flavour. Gram for gram, watercress contains more vitamin C than oranges, more calcium than milk, more iron than spinach and more folate than bananas. It is a very versatile kitchen crop and can be used to make delicious soups, added to smoothies or is just perfect with cheese dishes and sandwiches. It used to be that the gardening books recommended growing watercress in waterlogged areas or streams, which just isn't always possible! We grow watercress, very quickly and easily, in plastic plant pots. 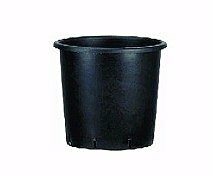 Large Plastic Plant Pot - I use a 25 Litre Plant Pot. t is best to use a plant pot that is wider, rather than a tall narrow pot. Seed Fill the plant pot with compost, pressing down firmly, until the pot is almost full. It can be filled almost up to the lip of the plant pot. Liberally sprinkle the Watercress seed over the surface of the compost, too much is better than not enough, and cover. The seed can be covered with compost, but as it is so small I prefer to cover with vermiculite. Vermiculite is very lightweight and offers little resistance to the growing seeds, whereas when covered with compost I do find that sometimes it can dry out and create a 'cap'. Once covered, place the plant pot in the saucer. Watercress is amazingly low maintenance, except for watering. As a semi-aquatic plant it must always have access to water. This is achieved by permanently keeping water in the plant saucer. Initially, fill the plant saucer with water and keep topping up until the compost is thoroughly wet. If possible, avoid wetting the compost from the top of the plant pot, as this will disturb the tiny seed. Once the compost is thoroughly wet, ensure that at all times the plant saucer is full of water. The water can be changed weekly, if it starts to discolour, but it must always be full. If possible, use rainwater to water watercress, as it is softer. Tap water can be used if necessary. Seedlings should appear in about seven to ten days. If growing early or late in the season, Watercress does benefit from being in a cold greenhouse or cold frame. From March onwards, it can be placed outside, on a patio perhaps, where it also benefits from any rainfall. Just ensure that the saucer never dries out. Watercress does not require any feeding. I find that Watercress prefers a semi shady position, some sun, but not all day. Your Watercress will be ready to harvest from about four to seven weeks after sowing, depending on the time of season sown and weather. Watercress positively benefits from being harvested, quite hard, and being treated as a cut and come again crop. Start picking when the stems are large enough to handle, about 4 or 5" in length, ensuring that a couple of leaves are left on the plant at the base. They will then readily re-sprout and a continual harvest can be achieved, throughout the summer and autumn months. Watercress is a very easy crop to grow, produces fresh, tasty and bumper crops and a single 25 Litre Plant Pot will produce the equivalent of twenty plus of the bags that are available in the supermarkets. Watercress is a very worthwhile crop to grow. Give it a go. Watercress seeds are incredibly small and a packet of seed will contain enough for at least a whole season. 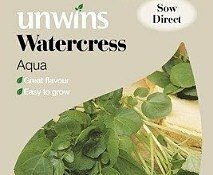 For example, we stock Watercress Aqua seeds from Unwins and a packet contains approximately a 1000 seeds. When we sow the seed we do sow a lot and start harvesting watercress as baby leaves. It will quickly grow to give larger leaves and bigger and bigger crops. We tend to sow about a third of a packet of seed for each 25 Litre Pot that we plant. If growing Watercress at home appeals, see below for all you need to grow your Watercress. The kit is reusable many, many times over. In fact we are still using the same kit that we started with five years ago. Once in use, the only expense would be filling the pot with compost (estimated at about a pound) and a packet of seeds, which would be enough to produce about four or five pots, if grown as baby leaves initially. If you love watercress you'll love Aqua. A great, peppery strong flavoured water cress that doesn't even need running water. Just keep in a damp place and keep moist and you will have a delicious healthy water cress to pick straight from the garden or windowsill. 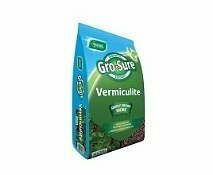 Gro-Sure Vermiculite is a naturally occurring mineral which has been heated to high temperatures to produce lightweight, absorbent flakes, perfect for a range of gardening tasks.